The first signs are subtle. You might have noticed a slight limp, or a suggestion of lameness that might be invisible to others who don’t know your horses as well as you do. You ask your vet to evaluate your horse, and the diagnosis returns as arthritis. Arthritis is a condition that is similar in both humans and horses. However, it can certainly impact how you interact with your horse from now on. Osteoarthritis, also called degenerative joint disease or DJD, is one of the leading causes of lameness in horses. It is a group of joint disorders, most frequently involving the hocks, front fetlocks, and the coffin joints and navicular bones of the front feet. Understanding how arthritis affects the joints is easier when you know how a normal joint functions. In a healthy joint, the bones fit closely together. The ends of the opposing bones are cushioned by a thick layer of rubbery material called cartilage. It not only protects the ends of the bones from grinding together and being damaged, it acts like a natural shock absorber to help absorb the impact from the horse’s weight hitting the ground with each step. It also provides a slick, frictionless surface for the ends of the leg bones to rub against as the horse walks, trots, and runs. The joint itself is composed of the tough, fibrous outer capsule and the inner synovial membrane. Collateral ligaments surround and connect the bones, their strong bands providing both protection to the joint and stability in motion. The joint cavity is filled with a thick, lubricating fluid. This thick, pale yellow fluid is called synovial fluid, and it bathes the joint whenever the horse moves. This synovial fluid is crucial to healthy joints, because it lubricates the joint’s soft tissue and provides nourishment to the cartilage, which does not have a blood supply of its own. This is also why damaged cartilage often does not heal well. 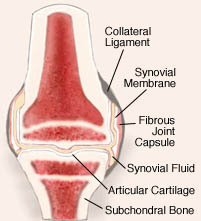 Synovial fluid is made of large molecules of hyaluronic acid, tangled together to form a thick barrier that prevents inflammatory cells from gaining entrance to the joint. These molecules are a basic need for healthy joints. When a joint is subjected to repeated stress or trauma, such as can occur with everyday riding, training, or racing, it often leads to damage of the synovial membrane and joint capsule. At this point, lameness is not always present. However, as the damage worsens, the horse becomes lame and the joint becomes hot and swollen. The damage to the tissue allows white blood cells to escape nearby blood vessels and invade the joint space. These white blood cells then release destructive substances which start to degrade the joint’s cartilage. Enzymes from the white blood cells also begin to break down the hyaluronic acid molecules. This results in synovial fluid that is thin and watery, and has poor cushioning and nourishing qualities. If left untreated, the joint damage progresses to arthritis and, eventually, degenerative joint disease that can become crippling. Once it has been damaged, the cartilage does not heal well. Since it does not have a blood supply of its own and must depend on the synovial fluid, which has also been degraded by the inflammatory process, the cartilage often does not repair itself at all. Once DJD is established, there is no way of curing it. It can be managed, but often leads to a horse’s premature retirement. Sometimes, horses with severe DJD must be put down. Read the next horse diseases article on Equine Infectious Anemia.